Learn how to cook like a French chef this Bastille Day with these recipes courtesy of Guillaume Brahimi. Guillaume Brahimi, who runs the coveted French restaurant Guillaume in Paddington, created each of these recipes with Tefal’s Heritage Triply collection. 1. 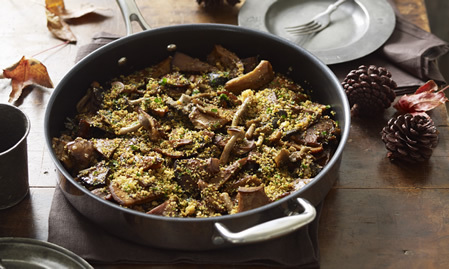 Place the Tefal Heritage Triply Pot Roast pan over high heat and add the oil. 2. When hot, add the beef cheeks and seal each side for 4 minutes or until brown. Turn down heat and add vegetables and herb and red wine. 3. Bring to the boil, remove from heat and allow to cool in fridge overnight. 7. Place pan in oven and cook for a further 20 minutes. 8. Remove and serve with Paris mash or rice pilaf. 1. Remove the seeds from the centre of the pear using a melon baller. 3. Add 20 gm of butter and pear halves flat side down. Allow pears to colour and then remove from the pan. 5. Add pears back into pan and reduce heat to simmer cook for 15 minutes or until pears are just soft. 6. Remove pears and allow pears to cool a little. 7. 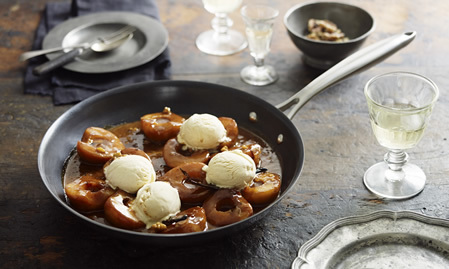 Place pears on plate, add salt to caramel sauce, spoon over pears, sprinkle with walnuts and serve a scoop of ice cream. 2. When pan is warm add 100 gm of butter, add eshallots and cook for 2 mins then add mushrooms. 3. Toss the mushrooms, when mushrooms are cooked remove and drain. 4. Place another pot on high heat and add remaining butter. 5. When butter reaches noisette add balsamic and emulsify to together. Allow balsamic to reduce by 1/2. 6. Toast the brioche and then crumble and allow to dry out. Fold through garlic and parsley. 7. Sauce with balsamic and garnish with sorrel and sprinkle with brioche crumbs. All recipes created by Guillaume Brahimi with Tefal’s Heritage Triply collection.